Lt. Gen. (Retd.) 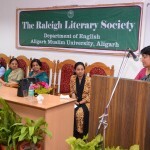 Addressing the audience. 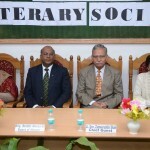 ALIGARH February 3: The La Madraza Literary and Cultural Society, an official students’ body of Bridge Course, Aligarh Muslim University organized the inaugural function. 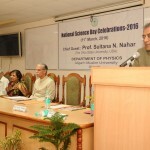 Lt Gen (Retd) Zameer Uddin Shah, Vice Chancellor, presided over the function. In his inaugural address, the Vice Chancellor said that the students of Madrasas are full of talents and they should use their abilities in obtaining modern education in order to get employment in higher services of the country. The Vice Chancellor further said that students of Madrasas need to change their mindset about their potential. For this, it is important that they prove their abilities in every field of knowledge and play a desired role in nation building. He said that he was planning to extend the Bridge Course into a two years’ course. He assured the students that the University will start science and Mathematics teaching under this course. Prof Ali Mohammad Naqvi, Guest of Honor said that AMU is the only University of the country to start a Bridge Course for Madrasa students. He urged the students to pay special attention to improve their English. Prof Rashid Shaz, Director, Bridge Course said that efforts are under way to bring intellectuals of all fields on one platform through inter faith dialogue. 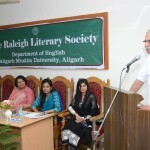 The program was addressed by Dr Samina Khan, Dr Syed Akbar Joseph and Dr Yasmin Rizvi from the Department of English and students of the Bridge course Shafeeq Beg, Tamanna Nishat, Abdur Raheem, Mushahid Raza, Mohd Ukkasha, Nazma Khan, Sharafat Hussain, Abdullah Ahmad, Junaid Ahmad, and Belal Ahmad. Mr Atiqur Rehman conducted the program and Mr Sarwer Alam welcomed the guests. 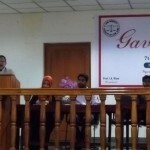 The Vice Chancellor gave away prizes to students for achievements in different categories. Razzaq Ahmad and Nazma Khan got the prize for 100% attendance, Abrar Ahmad and Sarwer Alam were awarded for best Essay, Atiqur Rehman and Nayeem Ahmad were awarded for best performance in the first semester and Mushahid Raza, Abdur Raheem, Haseer Khan, Ahmad Samani were declared the best disciplined students. The prizes were announced by Taheer Ahmad while Prof Rashid Shaz proposed the vote of thanks.